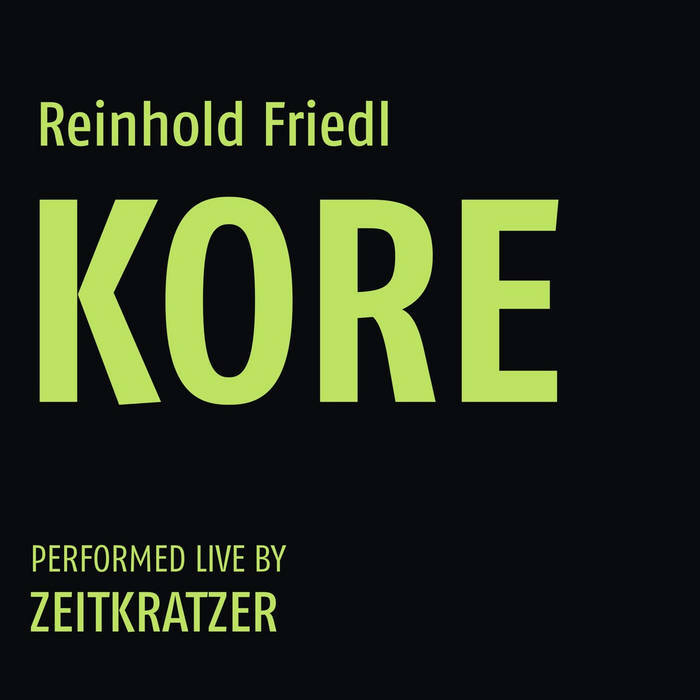 REINHOLD FRIEDL and his ensemble ZEITKRATZER perform „Kore“, a hommage to the French-Greek composer IANNIS XENAKIS. “Kore” is a natural advancement of REINHOLD FRIEDL’s earlier composition “Xenakis [a]live!” (released 2007 on ASPHODEL) – a homage to the French-Greek composer IANNIS XENAKIS. The piece is conceived for nine amplified instruments demonstrating ZEITKRATZER’s well established tradition of instrumental amplification (e.g. the early collaborations with ZBIGNIEW KARKOWSKI or MERZBOW and more recently with WILLIAM BENNETT of WHITEHOUSE) where playing amplified does not only mean making things louder, it also entails having a microscopic view of sound in which acoustic microsounds appear in a completely new context. The references to seminal XENAKIS’ tape compositions like “Persepolis” or “La Legende d’Er” are audible in the materials and textures, densities and sound masses performed by ZEITKRATZER, taking it to new areas of physical qualities that create a huge sonic architecture. Recorded live January 2013 during KLUB KATARAKT festival in Hamburg, “Kore” adds a stunning new chapter to ZEITKRATZER’s audacious catalogue and a new sort of intensities to contemporary chamber music. The zeitkratzer line-up includes FRANK GRATKOWSKI, who won the German SWR Jazz prize , the Norwegian French horn player HILD SOFIE TAFJORD (also known for her noise duo with MAJA RATKJE), the British trombone player HILARY JEFFERY, who toured a.o. with JIMI TENOR, MARC WEISER (cofounder of the Club Transmediale Festival in Berlin) and bass player MARTIN HEINZE from the BERLIN PHILHARMONIC ORCHESTRA. RASHAD BECKER was responsible for sound and recording.